WARNING: This video, shot by the advocacy group Mercy for Animals at a farm in Oklahoma, includes graphic and sometimes bloody scenes. It shows pigs being kicked, hit, and thrown, as well as pigs being slammed into the floor to kill them. The nation’s largest meat producer has announced new animal care guidelines for its pork suppliers a month and a half after NBC News showed the company undercover video of workers on one of its farms kicking and hitting pigs and slamming piglets into the ground. On Wednesday, Tyson Foods sent a letter to suppliers requiring that some farms stop using blunt force euthanasia to kill piglets and urging that all its suppliers keep sows in larger cages, install video cameras in sow farms, and adopt “pain mitigation” methods when castrating piglets or docking their tails. Though the letter encourages all suppliers to adopt a different form of euthanasia, its order to end blunt force euthanasia applies only to contract farms, meaning farms where Tyson owns the animals and the farm owner supplies meat to the company under contract. All other guidelines in the letter are recommendations. The head of the animal rights group that shot the undercover video applauded the company’s change in policy. "It’s heartening that Tyson has finally begun to address the rampant and horrific cruelty uncovered at its factory farm facilities by Mercy For Animals," said Nathan Runkle, executive director of the group. 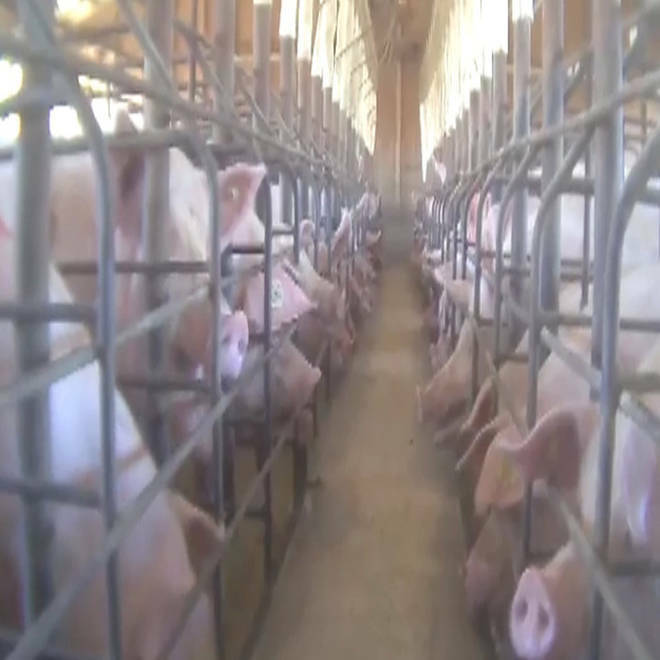 Undercover video shot by the advocacy group Mercy for Animals at West Coast Farms in Henryetta, Okla., allegedly shows workers hitting, throwing and kicking pigs. In November, Tyson Foods terminated its contract with West Coast Farms of Okfuskee County, Okla., after NBC showed the company video shot by an activist from Mercy for Animals. The activist worked undercover as a farmhand from mid-September to mid-October. The undercover worker who shot the video, “Pete,” told NBC News that abuse was “commonplace and constant” at West Coast Farms. He said that it included hitting, kicking, throwing, striking animals with the edges of wooden boards, sticking fingers in their eyes, and leaving piglets to die slowly after they were slammed into the ground “in failed euthanasia attempts.” According to Pete, some of the piglets were alive 30 minutes after being slammed into the ground. The owner of the farm said that the video showed "mistreatment" of animals and said he had taken action of his own. “I was stunned that anyone could be that callous in their treatment of any animal," said Lonnie Herring. "After viewing the video, I immediately returned to my farm and terminated the employees seen in the video." “It is a part of the business and there are prescribed methods of euthanasia and I follow those to a T,” said Herring. Tyson Foods owned the sows and boars on the farm, while Herring owns the farm itself and provided meat to Tyson under contract.